Solely from a name standpoint, Detroit Techno Militia seems pretty intimidating. If you knew nothing about this collective of artists, you may assume that they’re elusive or unapproachable just as I did when I was first getting into techno music. But in fact, the artists that make up the Detroit Techno Militia represent quite the opposite. This loving group of musicians is dedicated to their craft and to the genre, determinedly spreading the Detroit techno sound worldwide. The group is currently divided into two “super groups” based on geographic location. 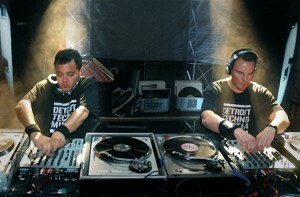 The DTM home team is devised of performers currently residing in the Detroit Metro area, such as: T.Linder, Darkcube, DJ Seoul, Neil V., DJ Psycho, and Annix. DTM Recon:313 includes members who live across the globe, such as The Mercenary, Doc, Loner 9, Maxx T, Dimitri Pike, Mad Alba, and Shawn Rudiman. 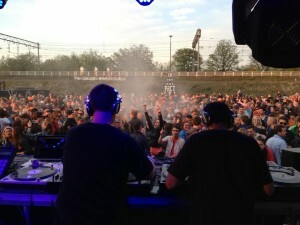 Their goal is to make Detroit techno universal and through extensive touring worldwide, they have been dominating dancefloors one city at a time. At a time when Detroit needs some good PR, this crew is handling all of the damage control by spreading the Motor City spirit through their soulful, futuristic, and uplifting sound. We were privileged to chat with 3 members of this established collective, T. Linder and DJ Seoul, who together make up the dynamic DTM 2×4, and DJ Psycho, Convergent Sound boss and an absolute magician on the turntables that will leave you inspired and full of foot cramps from dancing so damn hard. We caught up with the guys at Movement to discuss the worldwide techno scene, cataloging vinyl and the business of selling records, as well as what’s on deck for the rest of the summer. Robotic Peacock: How did the DTM 2×4 idea come about? DJ Seoul: We’re always looking to push the craft, ya know? Because like you can go anywhere in the world on any given night and see someone mixing two tracks, two CDs or two records. We’ve been friends for a long time and respect each other so we just decided why not try and do this together, at the same time? And it’s been amazing ever since. Reminds me of when I first started DJing because things will happen during the set that we don’t plan—it’s very organic. We just try and push ourselves and have fun with it and it’s made DJing so much more fun because now we’ve got our own setups. You guys travel all over the world and with your success could easily move elsewhere…amid the economic downfall and depopulation of Detroit, what has made you want to stay rooted in your hometown? DJ Seoul: Detroit is our city, it’s our home. The people here are beautiful. Tom and I were discussing this recently, and we think because we aren’t stuck here all year round, we love it. I think if I was stuck here I may feel differently about the city. But when we’re touring and we get to come back to this magical city and it’s our sanctuary. On any given day you can be in downtown and see Carl Craig at a deli or Mike Banks walking down the street and nobody is bothering them and the reason is because there’s so many great artists here in Detroit and no one is above anyone here. We’re some of the luckiest people around I think to live in Detroit. T. Linder: I was born and raised here so I didn’t know any different until I started touring. And now that I know different, I will always call Detroit home. 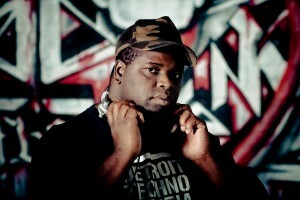 DJ Psycho: I’m a Flint kid, and I grew up with my relatives living in Pontiac and Detroit. The closer we moved to Detroit and the closer I got to the city, the more I fell in love with it. You’re all vinyl enthusiasts…you’ve seen the downfall of vinyl and now, in recent years, a revival in the format with things like record store day. what do you think has contributed to the resurgence of vinyl? DJ Psycho: First off, in my opinion, vinyl has never left. It’s the industry itself has tried to shut it off for so many years. I mean, go back and look at 1991 when they tried to shut it off-they failed. In 1994, they tried to shut it off and they failed, and it keeps happening in cycles. Now, it’s more of a commitment not only to us buyers but also to the labels. Now when you buy a record it’s definitely a commitment on both sides, which, is good for me because now you don’t have to wade through so much garbage. That’s a big advantage of dealing with vinyl versus digital. Anyone can put out digital and it could be of questionable quality, but a lot of people putting out vinyl now are making sure the music is universal – that it can be used in any scenario and I like that. Not to get down on digital, my own label does digital, but I like the commitment that everyone puts into vinyl. If you buy a digital track that’s hot you may play it a few times, but when you buy vinyl you’re gonna play it forever. DJ Seoul: And it literally exists in the world – vinyl is tangible. DJ Psycho: You can see it and put your hands on it. You can’t wrap your arms around an MP3 and wipe it off. Do you guys catalog your collection at all? DJ Seoul: We play many different styles, and all of those styles encompass a lot of genres. In my record collection I catalog everything based on what type of mood I would be in to play. There’s slower stuff, more modern sound, old school… There’s music I’d play with techno, my techno collection, Detroit techno… It’s not by genre, artist, or label—it’s by how I would play it. DJ Psycho: My collection is just stupid. Mine is rigidly timed. I have to have it alphabetical, chronological, and by genre, because well, I’m a wildcard. Otherwise I get lost. T. Linder: And for me, I think I kind of have a photographic memory, so I have a few sections in my collection – like I have an old school italo disco section and a hip hop section…but pretty much everything else I pretty much just remember where it is and I have two rooms full of records. Vinyl gets pretty heavy to carry around so its impossible to bring your collection to a set…how much planning goes into your sets and How do you decide what to play on any given night? T. Linder: I think that’s part of the art. You try to figure out what the crowd is gonna be like but also adhering to your style. Playing your style that works best for the crowd without changing your style. Picking out records in your studio at home is a major reward. DJ Seoul: And not by name, label, or artist, but by color of the record, marking, or a sticker you’ve put on the record— it’s a total different dynamic than computer aspect-alphabetical order. And the songs are probably fresher in your mind, too. With digital tracks they can kind of float away and get lost in your collection. DJ Psycho: Once again, it’s a commitment. T. Linder: Or it’s labeled wrong and your favorite artist is some other guy. (laughs) And it’s not to get down on digital, because we appreciate it all, it’s just not the way we choose to present our craft. From past interviews you’ve done I gather that the energy and overall enthusiasm for Detroit techno is far greater in Europe than it is in the U.S. Why do you think that is? What has contributed to that? T.Linder: Well, a lot of times when we go over there as techno DJs, we play parties that just have techno DJs or maybe one house DJ, but usually it’s a party with all techno DJs. Here in America when we play a party there’s usually more variety. In Europe the people who come out to our shows are die-hard techno fans – they’re not into trap, dubstep, or anything else, they’re looking for techno. DJ Seoul: And the dance culture over there is older than it is here even though techno was born in Detroit, the dance culture grew massive in Europe so there are more generations over there that are into it on a wider scale. We have a great time playing in Europe-always. Name a few places where the scene has completely blown you away. T.Linder: Well, for me the first one was right here. At Movement festival in 2002 – we were blown away. Germany, Italy, and Holland all surprised me a lot just how much they knew about techno and the know about Detroit techno and Detroit in general. DJ Seoul: Tresor is one of our favorite places to play in Berlin, but the passion for techno in Italy is actually totally out of control. I had some friends from Italy who are in town for Movement and the first thing they wanted to do when they got in was visit the old central station. They wanted to visit all of the Detroit tourist spots and I couldn’t believe they knew about all these spots – they’ve never been here! But their passion for the music is so deep they even dig deeper than the music to the city itself and what inspired the music. 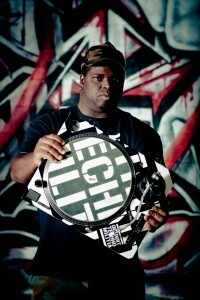 DJ Psycho: I kind of liken it to how with anything American or Detroit, they create a culture around our music. For example, you take the funk and soul / Motown over here in the states and it’s been swallowed up by major corporations and in effect white washed. Over there it’s a culture, they dress a certain way, dance a certain way, they come out for it and they know the songs and know some of the rarest stuff that even my dad would be surprised. So what America has a tendency to throw away, the rest of the world takes and turns into a culture. Any upcoming gigs/releases you’ve got lined up for the summer that our readers should know about? DJ Psycho: Playing as much as humanly possible. DJ Seoul: We got a bunch of releases coming up including an EP on Convergent Sound. DTM has lots of releases coming up. We’re going back over to Europe on tour at the end of the summer and possibly Australia. Can we expect any DTM 5×5 in the near feature? DJ Seoul: One key element is moving back from Vegas to Detroit. We’re getting the band back together! DJ Psycho: I personally cannot wait!